Huawei Ascend G700 user guide manual – Huawei Ascend G700 was released on August 2013 with comprehensive multimedia features for mid-range smartphone. 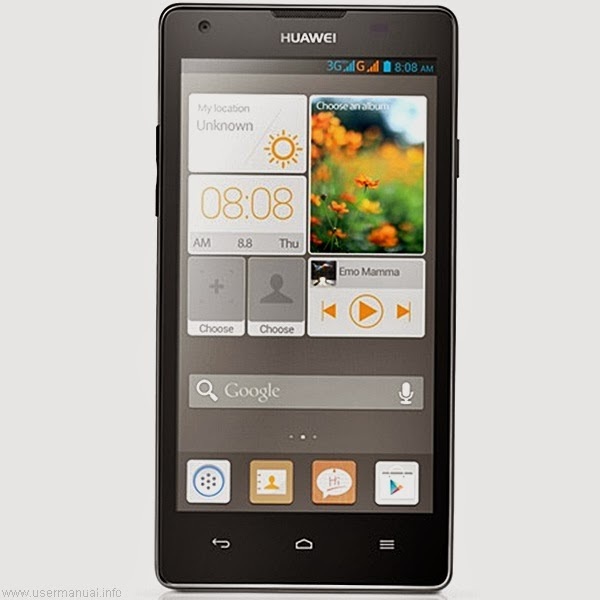 The Huawei Ascend G700 come with 5 inches IPS LCD capacitive touchscreen display and support for dual SIM card. Huawei Ascend G700 also equipped with GPS for Google Maps combination, 2 GB of RAM to handle downloaded files or to save your files like games, music and video. The quad-core processor smartphone from Huawei G series also carry microSD card and fast mobile support 4G. Huawei Ascend G700 equipped with specification and key features such as: 142.5 x 72.8 x 9 mm (5.61 x 2.87 x 0.35 inch) in dimension with 155 g (5.47 oz) for weight, 5 inches IPS LCD capacitive touchscreen 16 million colors 720 x 1280 pixels screen resolution with multitouch support, microSD up to 32 GB, 8 GB internal storage, 2 GB of RAM, 8 megapixel rear facing camera with LED flash and autofocus, 1.3 megapixel front facing camera, run Android 4.2 Jelly Bean operating system, powered by 1.2 GHz quad-core MediaTek MT6589 procesor PowerVR SGX544 and Li-Ion 2150 mAH battery. Huawei Ascend G700 user guide manual available to download in pdf file format with 34.4 MB size and contains of 96 pages. The manual pdf of Huawei Ascend G700 help owner of the smartphone with basic operational setting such as file Manager helps you manage files and applications in your phone’s, internal storage and microSD card. You’ll be able to view, create, edit, delete, move, archive, compress, and decompress files.